Developers are now seeking permission to build up 3 more storeys on top of their towers and platform to reach 24 storeys (in fact 25 with the size of the podium) and provide 299 residential units (up from 21 storeys and 254 units). 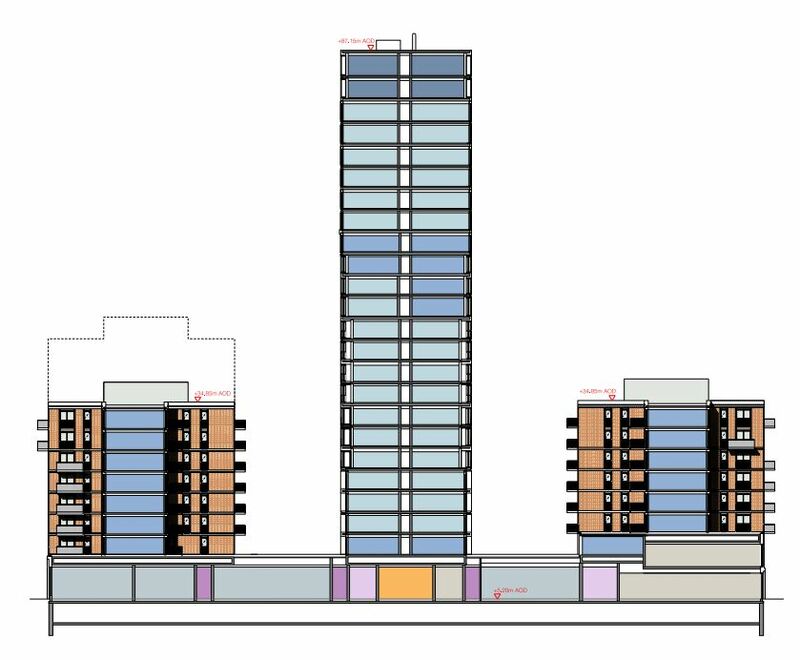 While the Council approved planning application 2015/0881 to demolish Homebase on 198 York Road, and replace by 6, 7, 9, 11 and 21 storeys to provide 254 residential units (read our article > HERE), developers are now submitting numerous changes to their initial plans. Erection of a podium building with three buildings above (providing part 2, 6, 8, 11 and 24 storeys plus basement level) to provide 299 residential units including affordable and market housing, with circa 5,943 sq m of Class D1 education space, including 537 sq m of associated Class A3/A4 café and drinking establishment space…. etc. Funny enough, the council’s website said that comments must be provided until 31/07/2017. In Wandsworth, thanks for commenting before the application is even registered! minimising changes in view of previous approvals and passing easily the Planning Application Committee scrutiny (variation of condition may be approved by officers under delegation of power). p.a. 2017/3886 registered 25/07/2017: Variation of condition: reduction in size of Blocks A and B; Changes to the ground and first floor podium façade; Changes to the façade on Block C … etc. p.a. 2017/4380 registered 08/08/2017: Erection of a podium building with three buildings above (providing part 2, 6, 8, 11 and 24 storeys plus basement level) to provide 299 residential… etc. 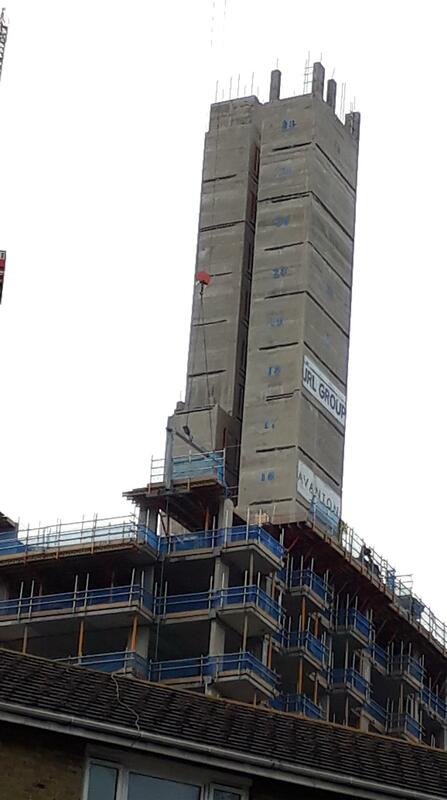 UPDATE 23/03/2019: As expected, we are reaching at least 24 storeys! Not only Wandsworth Council is known for approving planning applications in breach of local policies, but developers can be confident that the size of their scheme can be increased nearly un-noticed through mutiple planning applications (see below). From the initial screening application 2015/0231 registered 19/01/2015 with a 20 storey-tower, to p.a. 2017/4380 registered 08/08/2017 for 24 storeys plus basement level, it took 4 years to see the actual size being erected. 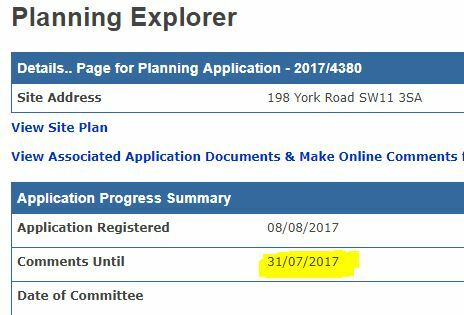 There are currently 18 planning applications for the site from 2015/0881 to 2018/5903 (with the first 5-7 regarding major amendments to the scheme) and still going on….